WinX DVD Ripper PlatinumThe strongest and fastest DVD rip/backup tool. Since 2006. WinX DVD Ripper Platinum is your ultimate solution to rip any DVDs simply in 3 clicks. It is best known for unmatchable fast video processing speed as the only DVD software reaching level-3 hardware acceleration. Ripping a full disc takes as short as 5 min. It is also the strongest for 99-title DVDs and always the 1st to support new DVD movies. Features: Convert DVD to MP4/H.264, AVI or whatever digital copy. 1:1 clone your disc to an ISO image, a video folder, or just save full title / main content with original video and 5.1 Channel AC3/DTS Dolby audio. Extract content for sharing. Play DVD with iPhone, iPad, Android devices or game consoles. WinX DVD Ripper for Mac is a solid DVD ripping software based on macOS. It stands out from similar products by seamlessly decoding all sophisticated DVDs while keeping original DVD image quality maximally. Rip DVD in 5 minutes with this best DVD ripper for Mac. Rip DVD to MP4, H.264, MOV, MPEG, AVI, FLV and back up DVD to iPhone, iPad, iTunes, Apple TV, QuickTime Player, Final Cut Pro, iDVD, iMovie, Android, etc. The unique DVD Backup feature brings you the fastest way to copy a DVD to ISO or MPG file with original DVD structure and untouched 5.1 Channel AC3/DTS Dolby audio and video effects. WinX HD Video Converter Deluxe is all-in-one video software that converts, downloads and edits SD/HD/UHD videos, e.g. 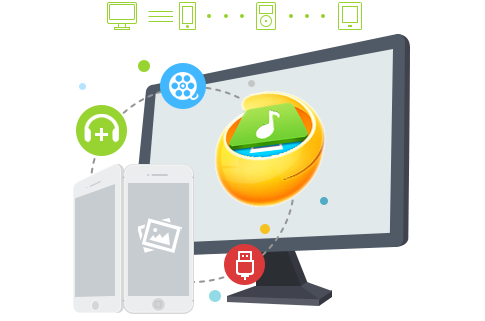 convert Multi-track HD BDAV, MPEG-TS AVCHD, M2TS, MKV videos to MP4, H.264 to HEVC, YouTube to MP3/AAC music, make different videos playable on iPhone, iPad, Android devices, game consoles, HDTV, etc. With the invocation of multi-core CPUs and exclusive Level-3 GPU Acceleration powered by QSV and CUDA/NVENC, it will decode, process and encode your large 1080p/4K files at No.1 fast speed while preserving high video quality. Compress, upscale, downscale, cut, crop and merge your GoPro, Drone and camera videos stably at one go. WinX HD Video Converter for Mac delivers a complete solution for Mac users to enjoy multimedia on a number of video players. Convert HD videos, download online videos, make slideshow, capture screen video with this all-in-one software. All mainstream videos are supported, including MKV, M2TS, AVCHD, AVI, MPEG, MP4, H.264, MOV, HEVC/H.265, FLV, F4V, RM, RMVB, WebM, Google TV, etc. Easily convert among these videos so that they can be played across iPhone, iPad, iPod, Apple TV, QuickTime Player, Android, Chromecast, Samsung, HTC, etc. Enjoy ultra-fast converting speed and optimum video quality. No more iTunes! 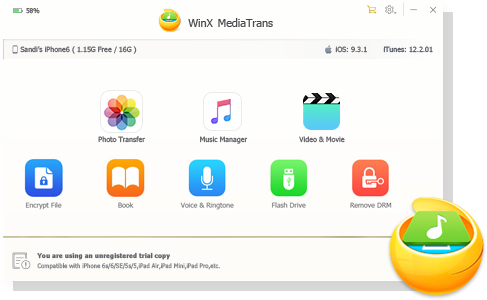 WinX MediaTrans makes it easier than ever to manage iPhone/iPad, and transfer iOS files from/to PC, no matter your targets are photos, 4K/HEVC videos, music, Books or others. Now experience multi-way transfer in seconds. This is a dedicated iPhone manager for Windows. Give you more flexibility in syncing and managing music, playlists and Books. Export and backup photos/videos to PC selectively. Move non-iTunes music to your iPhone. Make/add/delete ringtones freely. Auto convert media to MP4/MP3, HEIC to JPEG. Backup Voice Memos. It also turns your iDevice to a USB to store Word, Excel and any data. No Apple ID or iTunes needed - manage your iPhone extensively or selectively. Tested virus free. No third-party plugin. Enjoy new features without extra cost. Safe shopping. Free tech support. DVD Backup and Ripper Software: Download the Free DVD Ripper for Windows or Mac DVD Ripper, it will show you how to rip DVD to MP4 for iPhone iPad Android. If you need a clear DVD converter software that let you easy Rip DVD to MP4 (H.264+AAC) video, you can read and download the DVD-to-MP4 Ripper APP.